Winston Churchill only rode on the underground once. It was in 1926 during the General Strike. As Gary Oldman’s new film is dismissed as a fantasy, there remains a deep hatred for Churchill in the coalfields of Wales and Northern England. It was the aftermath of the great war that remained with every miner, docker and steelworker forever. Labour won in 1945 because it was truly radical. They won because Churchill was not trusted to manage the peace again. During the 1926 general strike, Bevan emerged as a key leader of the South Wales miners. Attlee, already an MP, opposed the strike action. Their different experience of class, trade unions and poverty shaped their temperament and attitude towards the establishment. Bevan claimed that he was not a politician but “a projectile discharged from the Welsh valleys.” Attlee became the first Labour leader to accept a peerage. For Bevan, the only war worth fighting was the class war, and public enemy number one was Winston Churchill. The roots of future battles began in the aftermath of the first world war. During that time, the miners, railway workers and dockers formed the Triple Alliance, an informal agreement that covered 1.5m workers in the key industries. If one of the big unions were to come under attack from the government, the other unions would strike in sympathy. The prospect of this alliance unsettled Churchill and fear of a militant uprising was forever at the forefront of his mind. In 1911, as home secretary, he had written a note that ‘thirty years ago, a general strike was a very shadowy proposal. Now it is a definitive objective deliberately advocated.’ Just a year previous to the note, under his orders, troops were despatched to tackle the Tonypandy riots, who had supported the miners. Churchill would spend the rest of his career defending his actions and the decision still runs deep in Wales. Churchill was continually engaged in a battle with the miners. In 1921, there were 1400 separate mining companies employing over a million men. Just as Churchill did during the second world war, the government of 1916 had taken the mines into public ownership to fight the war. Now it was peacetime, the Tories began to see the mines as a dead weight to the economy. If you want to understand why Labour won in 1945, you must understand how badly the peace was managed. The 1918 ‘coupon’ election was won by the coalition promising a ‘land fit for heroes’. The new electorate, which now included women for the first time, were hungry for change. Labour had put the working class at the forefront of the election, arguing ‘you cannot make war without us, you cannot make peace without us’. The party enhanced their vote to over two million. By the time the country went to the polls again in 1922, Labour had doubled their vote. This was down to the failings of the coalition. Trade union membership had grown to record levels as the economy transitioned back to its pre war state. Yet the government failed to respond radically. It delayed the implementation of the transformative education act and failed to clear the slums as promised. The blame for unemployment was not squared at the government. Instead, the Tories, supported by allies in right wing press, attacked the advancement of female suffrage. The Times argued that the female “life of idleness ought not to be paid out of the public purse” whilst Beaverbrook in the Daily Express called on the government to cut benefit to women for whom “domestic service is obviously a suitable employment.” In the Daily Mail, Rothermere ran a daily campaign about women who ‘abuse the dole’. The framing narrative was clear – unemployment was caused by the progression of female suffrage and women entering the workplace. In 1922, emboldened by an outright majority, the Tories felt confident enough to announce that unemployment benefit would be taken away from women who refused to do domestic work – even if it meant women leaving their own family to do so. In 1921, the Triple Alliance was tested for the first time – and it failed miserably. The unprofitable mines had asked for temporary support and for the government to reduce the use of overseas markets for coal. They refused. The miners who refused to accept wage reductions would be ‘locked out’ of employment. When the miners called a strike, a state of emergency was triggered under the ‘1920 Emergency Powers Act’. The union leaders buckled as the railway and transport leadership, including Ernie Bevin, withdrew its support for the miners. The allegation of betrayal would destroy the Labour movement for the next 5 years. In what was to be known as ‘Black Friday’ the troops were dispatched to the coalfields. The miners were forced back. Winston Churchill with Austen Chamberlain and Prime Minister Stanley Baldwin, circa 1925. Churchill was shocked when given the role of Chancellor. The failure of the government, the trade unions and the Labour party to defend the miners, led to a deep resentment within the coalfields. There would be further anger in 1925, when Stanley Baldwin appointed Churchill to the role of chancellor. At the Treasury, Churchill committed Britain to a return to the gold standard. In doing so, he aimed to make the pound as valuable as the dollar and, as such, overvalued sterling by 10%. He clashed with John Maynard Keynes, who argued that prices would have to fall in order to meet the adjustment or unemployment would rise. When industry bosses had to make up the shortfall, the choice was simple: wage cuts or smaller profits. It was in the coalfields that the cuts would hit the hardest. Since 1913, the miners wages been reduced by nearly 50%, as the pits struggled to remain economical. When further cuts were proposed in 1925, the miners refused to stoop any lower and the Triple Alliance began to work together again. An early crisis was averted when the government promised to order an enquiry into the future of mining, Other industrial unions joined the Triple Alliance. It was clear that the attack on the miners would be a testing ground for the rest of the country. The union leaders warned that every worker would face wage cuts if Churchill’s economic polices were pursued. Baldwin appeared to confirm this himself, declaring “all the workers of this country have got to face a reduction of wages to help put industry on its feet.” The miners were incensed at being portrayed as the enemy within, halting the progress of the British economy. The commission published its findings in March 1926. Samuel recommended the government nationalised the mining royalties and improved the working conditions. He proposed a national wages board to restructure the pay of staff and to end the subsidy. Most importantly, it proposed further wage cuts. Bevin declared the findings ‘a declaration of war’. On the 30th April 1926, the mine owners announced their proposal – a 13% cut in pay and a return to an eight hour day. A day later, one million miners were locked out of their workplace. 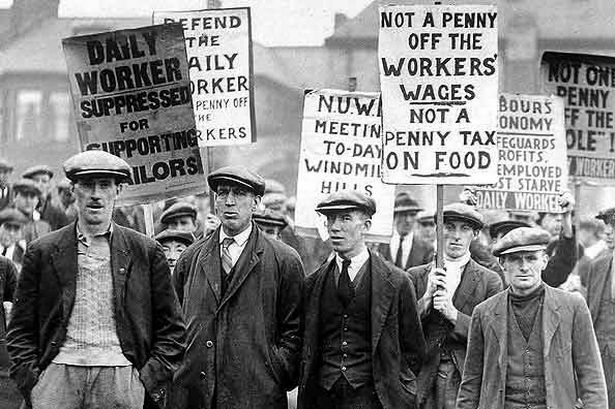 The TUC called the general strike on the understanding that they would take over the negotiations from the miners leaders. Yet when Baldwin met with the TUC he recognised that the leadership was as worried about a general strike as he was. Baldwin, Lord Birkenhead, and Arthur Steel-Maitland were prepared to reach an agreement to avert a strike. Another section of the cabinet were itching for a fight. That section was led by Winston Churchill. As Bevin tried to draw up a compromise acceptable to the miners, Churchill was charged with drawing up the government response. Churchill was aghast at negotiating whilst under the treat of a general strike, demanding the miners accept aspects of the Samuel Report or negotiations should cease. Baldwin refused to give the TUC the ultimatum. There would be further confrontation between Churchill and Birkenhead, after two weeks of subsidy was offered to the miners. Bevin later claimed that Churchill had stormed into the meeting and demanded an end to the talks. The New Statesman claimed that Churchill had argued that ‘a little blood letting would be all to the good’ something he would later deny. The negotiation ended abruptly when Baldwin informed the TUC leaders that the strike had already started. It turned out to be an unofficial walkout by print workers at the Daily Mail, who had refused to print the paper’s lead article ‘For King and Country’. On the first full day of action, there were estimated to be between 1.5 and 1.75 million people out on strike. Over the next few days, Churchill would become instrumental in breaking it. News control became his key concern and he wanted to commandeer the BBC through the strike. Although it was refused, any news that might encourage the strikers was suppressed, with the TUC and Labour leaders banned from broadcasting. Churchill meanwhile met with the newspaper proprietors and warned them that ‘something must be done to prevent alarming news being spread.’ The print workers had joined the strike, so the government produced its own publication. For Churchill, a former journalist, playing at editing his own newspaper was a dream come true. The British Gazette appeared on the morning of the 5th May, defending the government and condemning the strikers. Lord Citrine, later remarked that the paper was ‘a poisonous attempt to bias the public mind’. The TUC responded with the British Worker, but could not match the government effort. Churchill had cleverly requisitioned all the newsprint stock from The Times, Daily Mail and Telegraph to allow his paper to reach as many people as possible. Churchill had the capacity to print over 2 million copies of the paper, under the guise of the national interest. Even some members of the government believed he had acted recklessly and he caused more anger when the food stocks arrived at the docks. Churchill asked for it to be escorted by tanks and machine guns, strategically placed along the route to central London. Those ‘little earthworms’ would be called upon in 1939 to win Britain another war. Under the stewardship of Ernie Bevin, the central planning of industry saw the mines brought back under government control. When the war ended, Churchill asked the people to trust him to implement the Beveridge reforms, build an NHS and create better working conditions for returning troops. Labour meanwhile, campaigned on the message of ‘Let’s win the Peace.’ It wasn’t even a contest. During the 1945 campaign, Churchill let his statesmanlike mask slip, when he accused Labour of needing to use ‘some kind of gestapo’ to implement socialism. Haunting memories of 1920s poverty, unemployment and desolation returned. Never again the people said. Never again. Next Post Managed Decline: Will Labour and Rugby League break with their Heartlands? ‘Never again the people said. Never again.’ You mean apart from the fact Churchill won the next election? Was there some resentment, particularly from the far left, about Ernie Bevin in that he was perceived as too willing to negotiate? Great blog, by the way!